Total Physical Response (TPR) was developed in the late 1960s and is a listen-and-respond technique used for teaching vocabulary or language concepts. Physical movement is used to help students react to verbal input. This technique mimics the way that young children learn language. It also lowers stress and decreases student inhibitions. The act of moving is memory-friendly. TPR creates a link in students’ brains between speech and action. This link boosts vocabulary and language learning. It also makes learning fun and is a way to get students moving. TPR is best used when teaching vocabulary words associated with actions. It is most effective when used with either English Language Learners, native language speakers learning new vocabulary words, or students with language delays. Prepare: First, the teacher selects the vocabulary to be taught to students and gathers any pictures or props needed to illustrate the meaning of the words. Teacher Modeling: The teacher says the new vocabulary word out loud for students to hear. 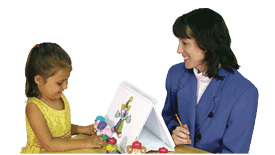 As the teacher says the word, gestures, pictures, facial expressions, and/or props are used to demonstrate the meaning of the word. Student Modeling: A few student volunteers imitate the same gestures, facial expressions, use of pictures, and/or props modeled as the teacher says the word. Student Participation: All students in the class now imitate the gestures, facial expressions, use of pictures, and/or props that were first modeled by the teacher and student volunteers. The students say the vocabulary word as they make the movement. Writing: The teacher writes the vocabulary word in a place where all students can see it. This helps students make connections between oral and written words. Repetition and Practice: This technique is used to continue to teach new words and phrases. New and old words are repeated and practiced many times to ensure learning. Total Physical Response is just one of many tools to teach language. It should not be used in isolation, but with other approaches and techniques to provide the best education to students. “Total Physical Response (TPR),” The Teacher Toolkit, accessed November 27, 2017, http://www.theteachertoolkit.com/index.php/tool/total-physical-response-tpr.